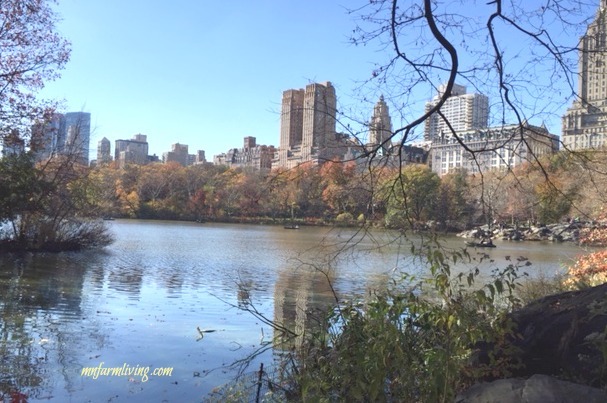 I just checked off an item on my bucket list – I visited New York City. Prior to my visit, I only had my imagination to understand what the city was like. 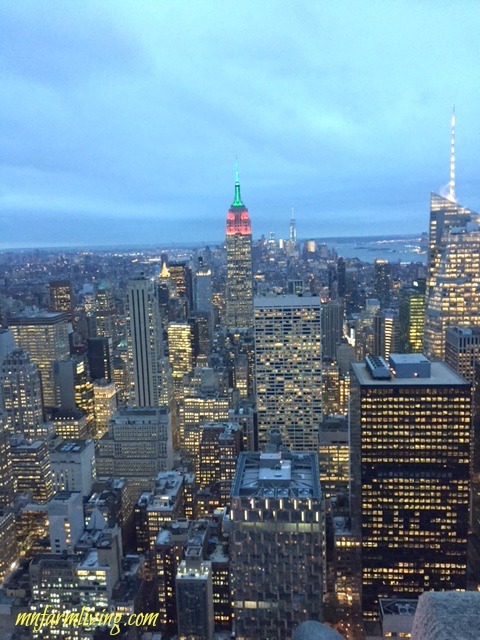 My daughter joined me for a brief five-day trip to the Big Apple where I now have real-life knowledge of NYC. We did many of the typical touristy things – broadway shows, Brooklyn bridge, ferry ride to Staten Island, Central Park, shopping, etc. 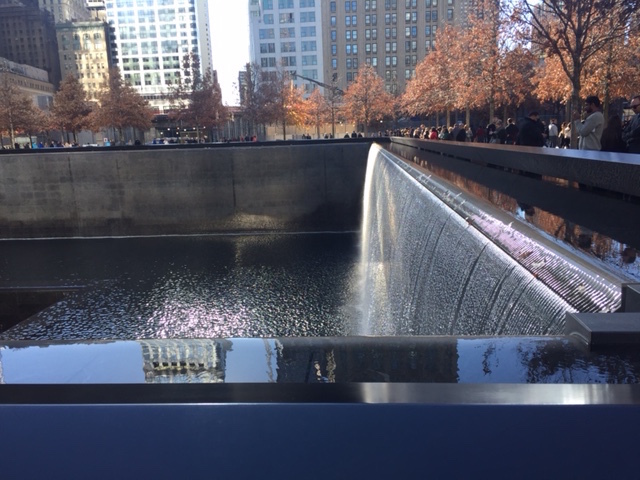 At the end of our trip, I summarized our trip with a top 10 list of what I learned about New York City. 1) There are lots and lots of people. No, I mean lots and lots of people. I was expecting crowds but didn’t fully comprehend the reality of a literal sea of people. And it started from my first step off the airplane. We flew into LaGuardia Airport and people were lined up right next to the gate as we walked off the ramp. And it wouldn’t get any better than that. Think “Minnesota State Fair” crowds. That is what NYC is like. Everywhere. All the time. 2) Solicitation is fairly aggressive. And by solicitation I am meaning people trying to sell items and services such as bus rides, horse carriage rides, tours, picture taking, stocking hats, etc. It was endless . . .
3) I highly recommend taking the hop-on hop-off bus and make your way to the second level of the bus. We used the City Sightseeing bus. It really gives you a different and unique feel for the city. And buy the two-day pass because it allows you to hop on and off at multiple locations over two days. The bus ticket looks odd – it will remind you of a very long grocery store receipt. And don’t lose it because you have to buy it again. That’s all I will say . . . .
3) The city is clean despite not many trash disposal areas. For as many people that reside and work in the city, it is surprisingly clean. I was really impressed with it’s relatively cleanliness. 4) I loved the street entertainment. Probably one of my favorites – the impromptu acts (well, maybe not impromptu but I will think they were). 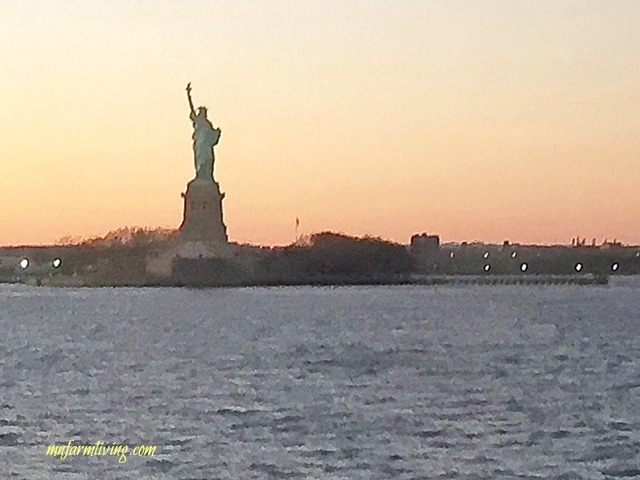 Here is a video of one act that we watched near the Brooklyn Bridge. And, by the way, we walked the bridge. 5) Broadway shows are awesome! I loved them. We went to Wicked and the Lion King. The talent and music was amazing. And for those of you that remember the TV show Knots Landing, Michelle Lee is in the show Wicked. Talented as ever. But skip ordering a drink. 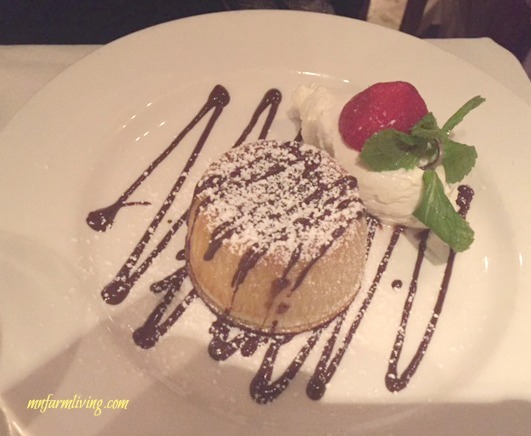 We ordered a drink and a small snack for two – $40. A little strong for midwesterners. 6) I love Uber! And learned a great lesson at the same time. When we arrived at the airport, we planned on taking the taxi to the hotel. As we picked up our baggage from the baggage carousel, an attendant was located right inside the door and asked if we were looking for a taxi. And we answered yes. He ushered us not into a taxi, but a newer and bigger vehicle than a typical “taxi cab.” Well, the lesson learned is it cost us twice as much to ride this vehicle as it did to ride Uber on the reverse trip. Just use Uber. On the reverse side, the attendant was nice and helpful and probably needed the extra income. 7) Food is fabulous! All the food was wonderful. No complaints. 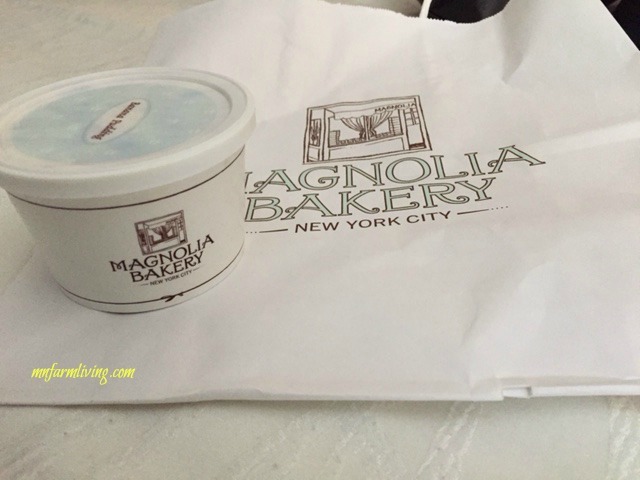 Magnolia Bakery was near our hotel and we loved the banana pudding. And, by the way, bakeries are open till 11:00 or midnight. 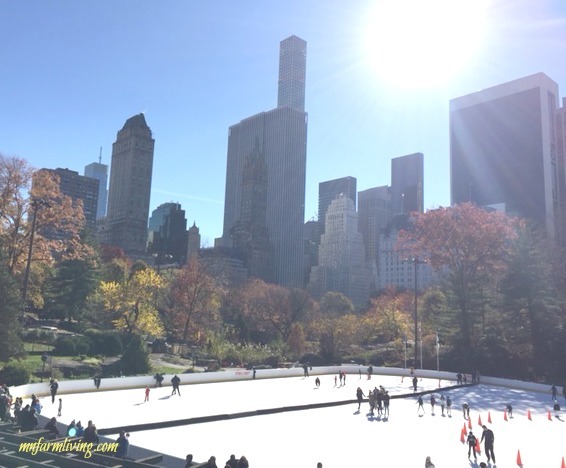 8) Central Park is a must visit. I completely understand why NYC needs a Central Park. It’s about keeping your sanity. You need space to get away from all the people, life hustles and the claustrophobic feeling from all the tall buildings. And the best part of the park are the street performers. We watched a gospel group sing and I actually bought their CD. And let me say – I don’t ever buy CD’s. But it was so fun watching their joy in performing and listening to their melodic voices. 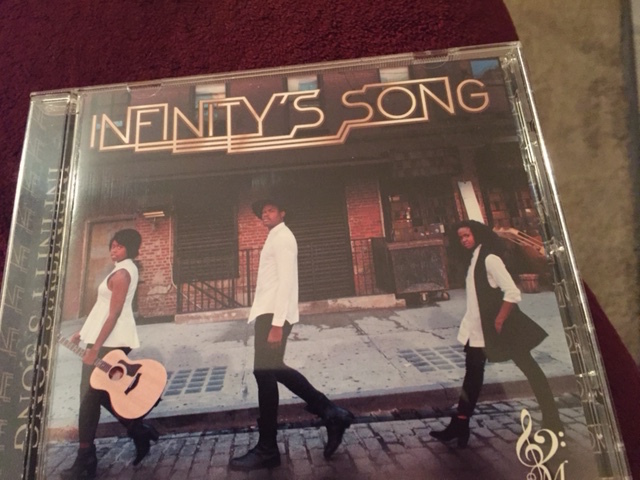 The group is called Infinity’s Song and upon a little investigation, they have performed on The View television show. Just pure delight. . . Enjoy the snippet of their Central Park performance. 9) Despite what you may think, see and hear lately with all the terrorism threats, I felt safe. Police and security was present everywhere in NYC. And as uneasy it was to see, we also saw police with AK47’s or some sort of assault weapons (I am gun illiterate) in hand in while they were in Times Square. Even so, I never felt unsafe. 10) My fitbit and I were best friends. We stayed close to the theater district, which is near Times Square. But when you are in NYC, you do a lot of walking. I hit over 23,000 steps one particular day. 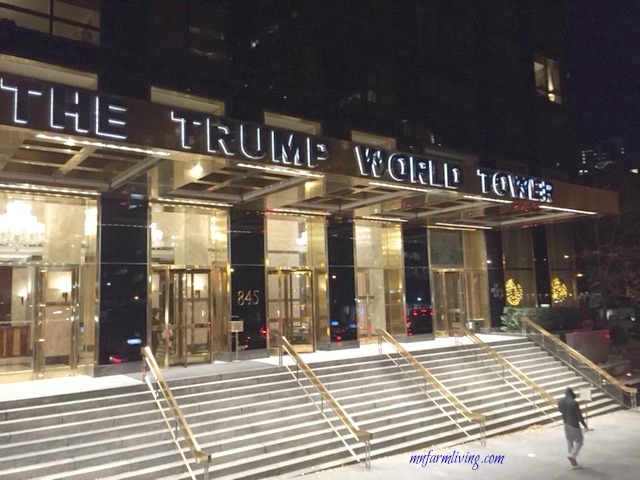 And I used those steps to see sites such as the 9/11 Memorial, the Statute of Liberty and the beautiful view from the top of the Rockefeller building. 10) Television shows. 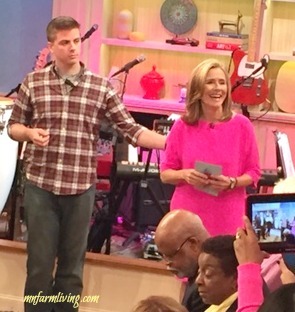 We were audience members of the Meredith Viera Show and the Today Show. It’s just really interesting to watch how a television show is produced. And it was just plain neat to be that close to celebrities. 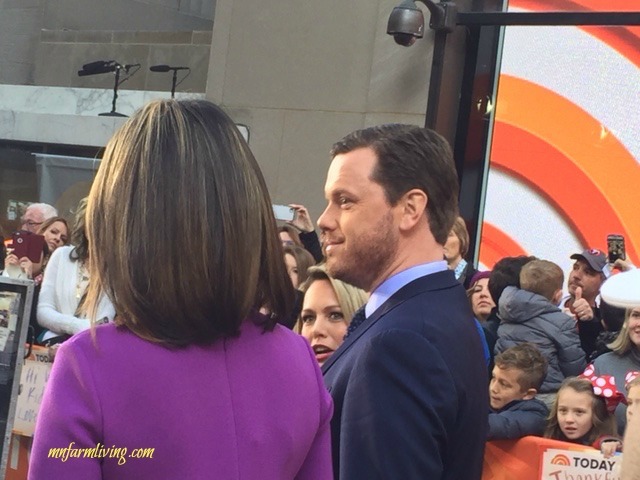 Dennis Quaid and Drew Lachey were guests on the Meredith Viera show while we were there. Five days in New York City was long enough. I am glad I went to see the city and saw what I saw, experienced what I experienced and heard what I heard. But my comfort zone for me is home, space, nature and my lonesome gravel road. As I was driving home I couldn’t help but feel bad for the people who live in the inner city who don’t see sunsets, sunrises or even the sun . 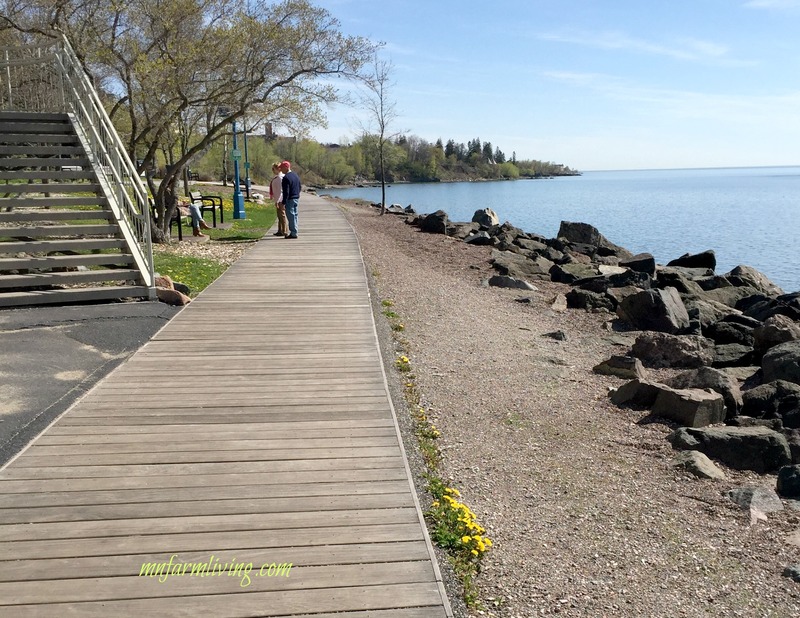 . .
Duluth, located on Lake Superior in northern Minnesota, is one of my favorite places to visit! Why? It’s a place I can let myself go and forget just about everything. It is a peaceful and relaxing place to get away from the busyness of life. We try to visit Duluth when we can fit it into our schedule, even if it’s only for a few days. By car, it’s about a five hour, well worth the trip. But the true beauty in Duluth is well worth the trip. 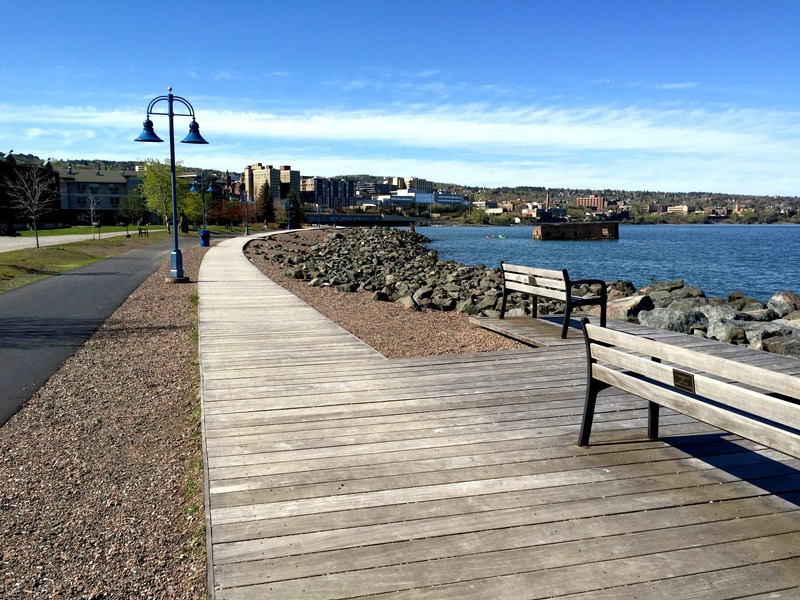 Take a break and come along for a “Duluth Fix” virtual tour. Visiting Gooseberry Falls north of Two Harbors, MN. The waterfall was showing it’s fierceness while we visited during mid May, 2015. 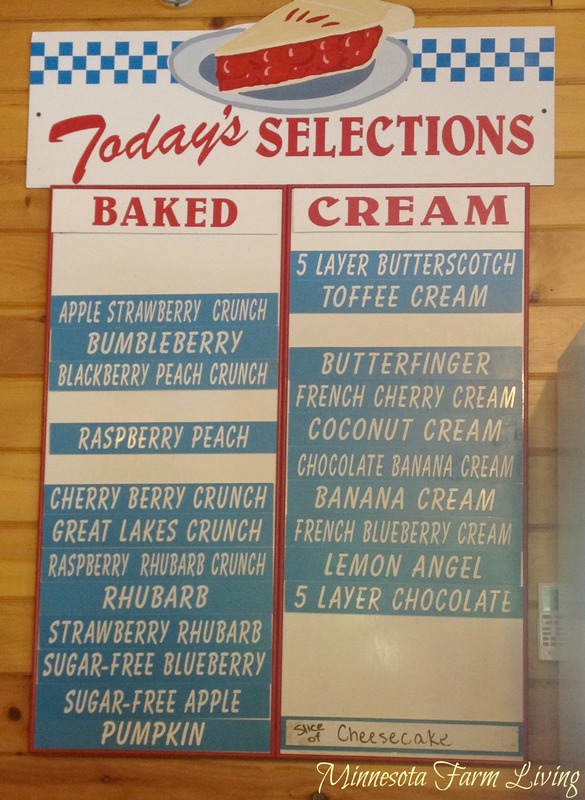 And a stop to Betty’s Pies north of Two Harbors is a must! They have so, so many different flavors of pies, it’s hard to choose just one! My pie choice was the Raspberry Rhubarb Crunch. So good! 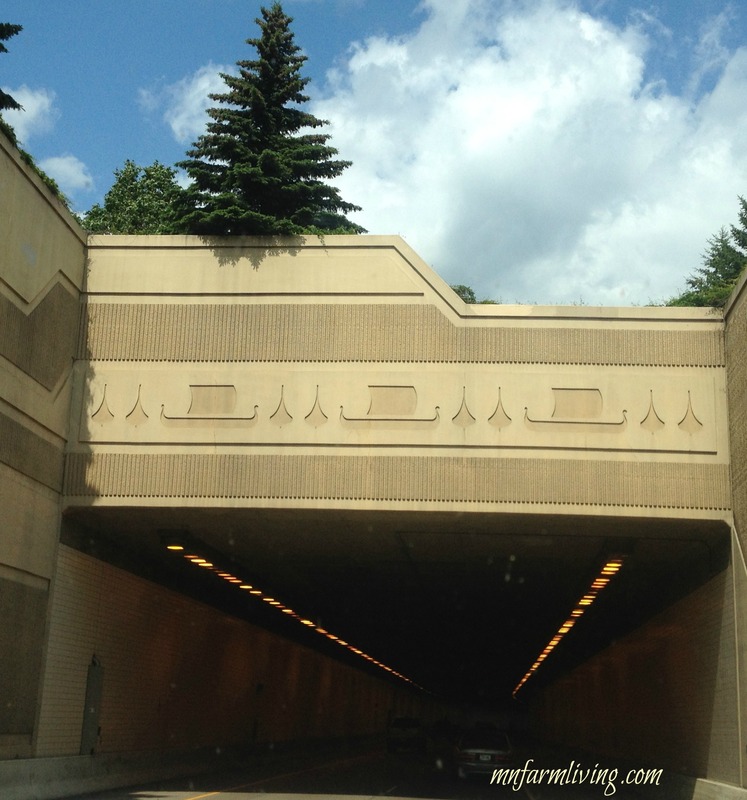 Duluth is proud of it’s history and heritage noted by the motif on the overpass. 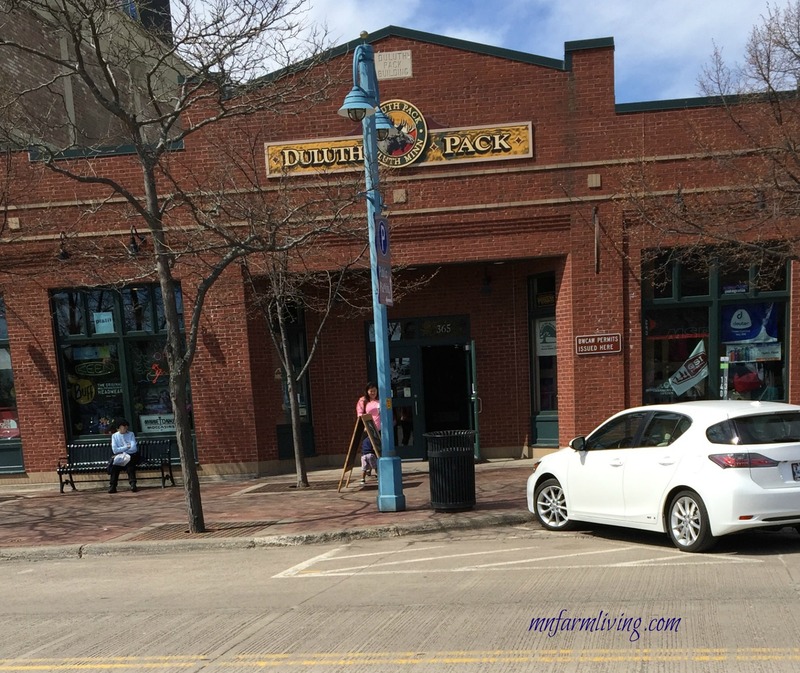 If you are fortunate to take the Lakewalk in Canal Park, you may have this train pass you by! The North Shore Scenic Railroad ride is a relaxing experience and the open cars are the most fun to ride in. Even at 43 degrees, store owners had their doors open. It was really fun to watch Canal Park get ready for it’s big Memorial Day weekend – the kickoff to a very busy tourist season. And Duluth caters to it’s tourists! And ships coming and going out of the harbor. This video was taken a year ago. We only had a few ships coming and going when we were there the past few days. Some of our Duluth traditions do focus around food. Along with eating at Betty’s Pies, we also enjoy Chicken Wild Rice Soup at Grandma’s. 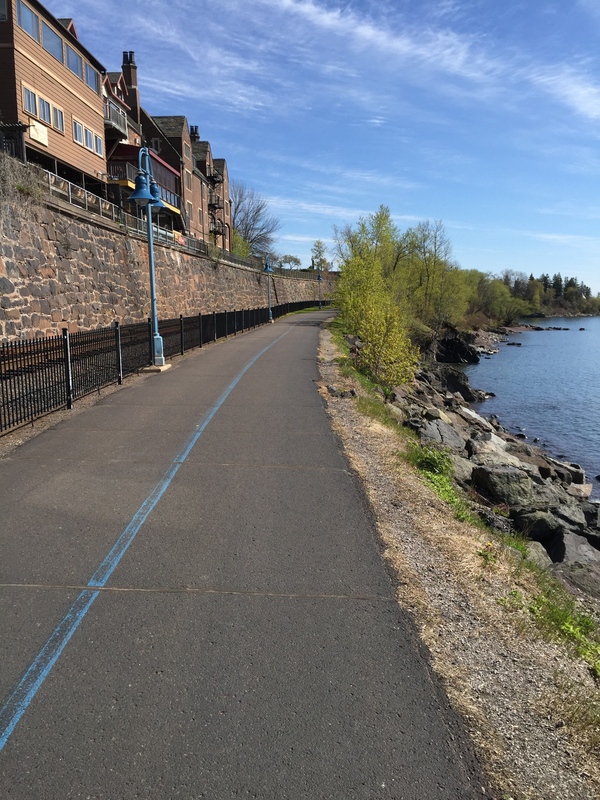 When we travel to Duluth, we either stay somewhere on the North Shore or in Canal Park. Our favorite place to stay in Canal Park is the Inn on Lake Superior. 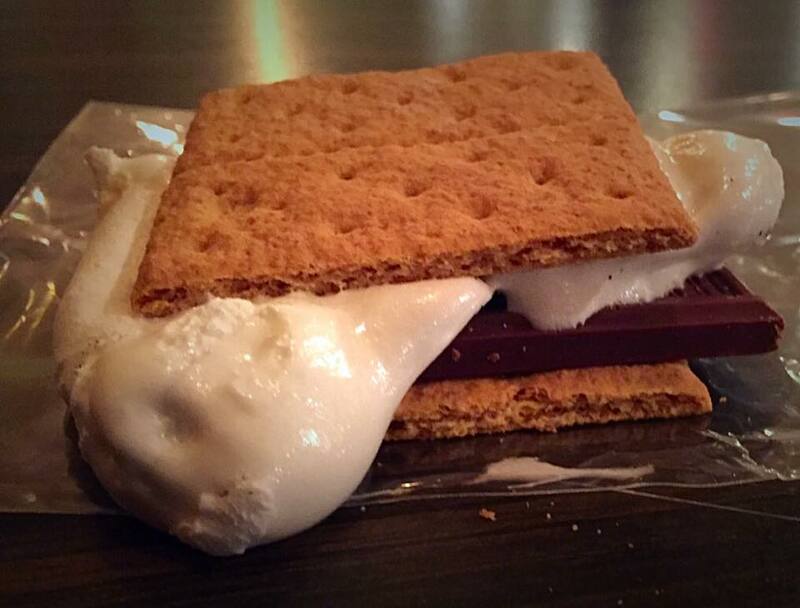 They have S’Mores available every evening, summer or winter. So fun! If you are ever have the chance to travel to Duluth, I highly recommend it. Enjoy the beauty and peacefulness the lake and the city has to offer.